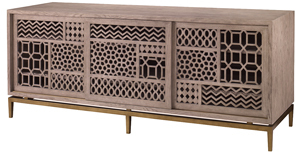 Constructed to provide the ultimate in aesthetics, the Tito Low Cabinet’s aged brass with inlaid mirror elements conceal a multitude of storage. Thoughtfully crafted with back-ended cut outs for cord management, this piece is truly a modern take on classic marquetry. Finished with hand applied Gold Bullion Leaf and topped in incandescent stone, the Crowd Pleaser is equally eye catching as useful. Expertly crafted to meet every entertaining need, this console features an impressive triple compartment interior, complete with adjustable shelving, four drawers and proper anchorage to support a large screened TV. Solid wood and finished in antique gray the Fair Ridge Console is sure to impress. 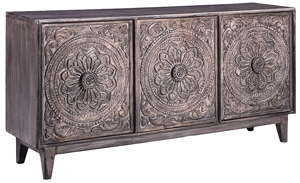 Fronted with hand-carved floral doors, artfully disguising considerable storage; this multiuse console is perfect for placement as an entryway piece or more functionally within the dining/living areas. 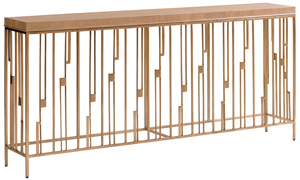 Part of the Lexington Shadow Play collection, the Studio Console provides an unstructured substance with a touch of sophistication. Its hand-forged base, burnished silver leaf finish and unique Grey Elm surface create a textured and contemporary appearance ideal for use in the entryway or as a dining space focal.